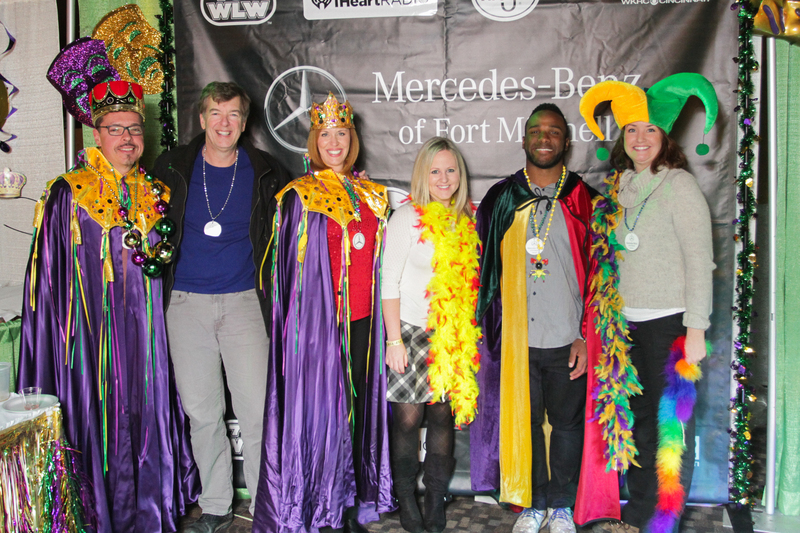 Be sure to mark February 9, 2016 down on your calendar – you don’t want to miss The 25th Annual Mardi Gras for Homeless Children presented by Mercedes Benz of Fort Mitchell! Produced by the Northern Kentucky Restaurant Association (NKRA), this event is a don’t-miss for anyone who likes to have a little fun, New Orleans-style, while also helping Tri-State area homeless children get the food they so desperately need. Everyone can enjoy this culinary-tasting experience, with lots of food and beverages from over 50 local restaurants and beverage purveyors. Graze your way through the Northern Kentucky Convention Center while listening to live jazz entertainment from Robin Lacey and DeZydeco Band, and feast your eyes while you’re sampling the goods on stilt walkers, clowns, live and silent auctions, and the exciting and prominent Mardi Gras Parade, led by the Beechwood High School Marching Band. This year’s Mardi Gras court features Mardi Gras King Mike McConnell, of 700WLW and Mardi Gras Queen Sheila Gray, of Local 12 News. Grand Marshall is Giovani Bernard, running back for the Bengals, and the whole event will be emceed by Harry Stephens and D-Lo from KISS 107. Mercedes Benz of Fort Mitchell has been a proud sponsor of this event for three years, and are glad to name Local 12-WKRC Cincinnati, FOX19, Remke, Mondelez, KISS 107, 700WLW, iHeart Media and Starr Printing as promotional sponsors. Tickets are available for $60/person, which provides admittance for the entire event from 6:30pm-10:00pm; you can purchase tickets at Mercedes Benz of Fort Mitchell, Hofbrauhaus Newport, Marriott RiverCenter, Embassy Suites RiverCenter, by phone at 859-291-6572, or online at www.2016mardigras.org. VIP tickets are available for $80, which allows you entry to the event at 5:30pm. Enjoy great food, listen to great entertainment, see local celebrities and help those in need: come to the 25th Annual Mardi Gras for Homeless Children!